Preparation of our robots is now in full swing to get them up and running for our first demo. 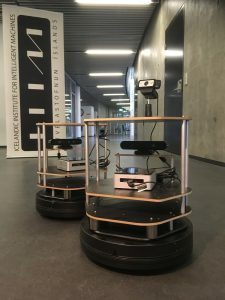 The on-board cameras all need to run at the same time which we have been testing as well as getting the robots to communicate through the CCMCatalog. The first trial run went pretty well but afterwards the processing server decided to (literally) blow up. This called for some time being spent on finding a replacement server after already having lost precious time due to prolonged robot battery delivery discussion with the vendor. This entry was posted in CoCoMaps, Company News, Projects News, Uncategorized. Bookmark the permalink.